God is doing great and miraculous in and through us, thanks for being a part of it! For the past month, the ship has been in various stages of construction, as pipes, walls, and floors get replaced, major projects get completed, and the hull and propellers get cleaned from their yearly buildup of barnacles and seaweed. Shipyard was in Las Palmas de Gran Canaria, which are islands just west of northern Africa. 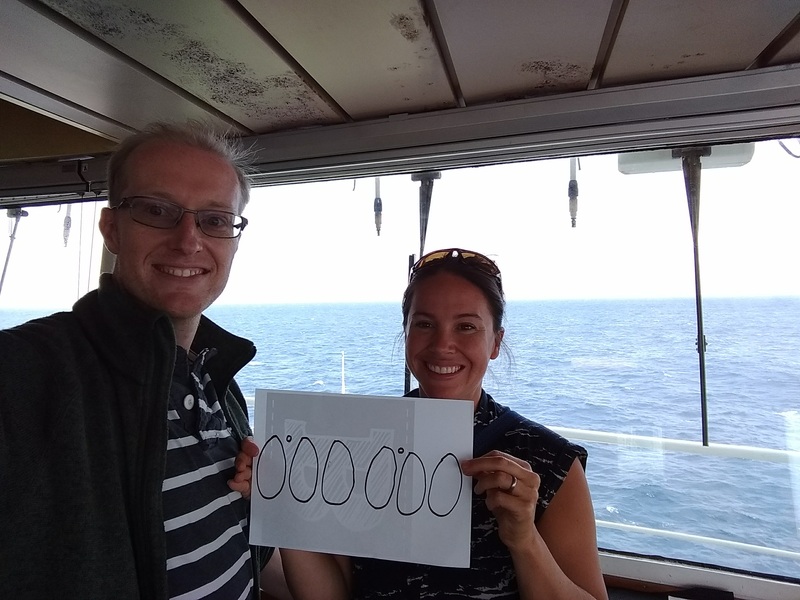 We left shipyard on the 4th of August for a two week sail around the west coast of Africa. During the sail, we saw flying fish, whales and dolphins. What a pleasure to see a new part of God’s creation, and to feel so small amidst miles of ocean in every direction. The rolling seas were punctuated by an official ceremony on board when we crossed 0.0˚ latitude, 0.0˚ longitude, making us now Royal Diamond Shellbacks, a special honorific among mariners for crossing the Equator at this place. 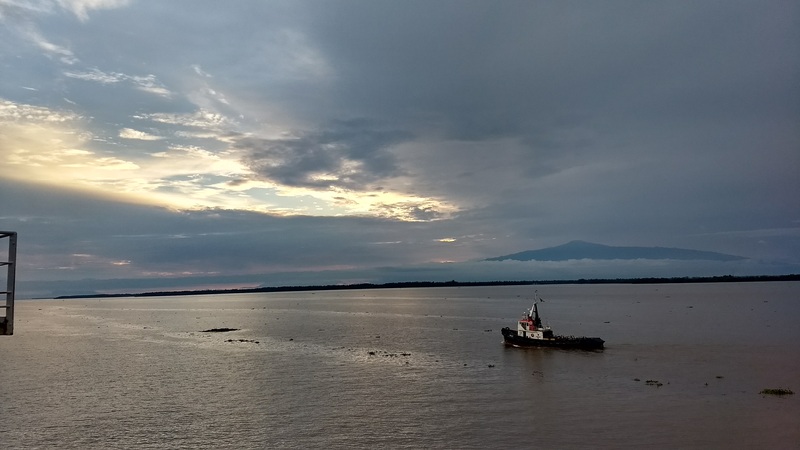 We then arrived in Cameroon about 3 weeks ago, entering the large muddy Wouri River and docking in the port of Douala. We were greeted by fanfare and celebration including at least five different bands, dancing, and waving of flags. We were reunited with our friends who were part of the Mercy Ships advance team who had spent the last 6 months in Cameroon preparing a way for the ship to come. Later, the Minister of Heath gave us an official welcome ceremony and speech, as this is Mercy Ships’ first time in Cameroon. What a wonderful joy to see the hope in people’s eyes and the need for medical care. We only pray that we can live up to expectations and be the hands and feet of Christ here in this new land. Since we have arrived, the ship has been a whirlwind of activity. 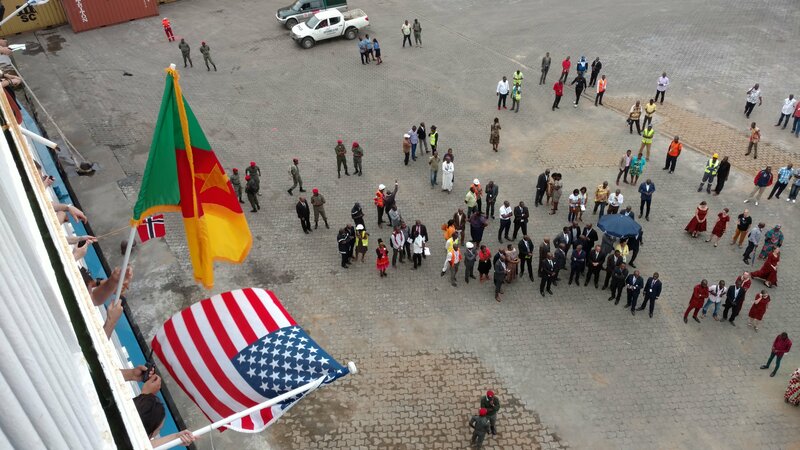 The Cameroonian government is excited to have us here and has asked us to turn-out a record number of surgeries and medical trainings this year. As a result, we needed to get programs up and moving more quickly than usual; internet services connected, and mobile hospital tents constructed with electricity, plumbing and network before the first patients arrived. This was a huge job! To make this happen, we’ve all been working overtime. This includes some unique trouble-shooting, like when a large container ship forklift ran through the internet cable last week snapping it in two! Will has also been running network cable down to the docks, and setting up the internet, printers, and computer’s in the three large tents, as well as setting up temperature monitors for the hospital refrigerators. Briana has also had her hands full with training and getting new crew up to speed, which includes round two of her 9 week management training courses, English and French language training for crew, as well as city and cultural informational tours for ~40 people with her new co-worker. In between work, we have not had a lot of chances to get off the ship, but we are hoping to get out and explore a little bit more. The country is very green and lush, with jungle rain forests all around. Cameroon is located near the equator in one of rainiest places on earth. Apparently there are three seasons here: Hot, Rainy and Very Rainy (we’re no in Very Rainy season). Most of the people in the port city Douala speak French or tribal languages, but a handful of well educated people also speak some English also. In addition, there are two Cameroonian provinces in the west which speak primarily English. We miss you all and would love to hear how you’re doing! Our website/blog is temporarily down, but you can still reach us by email (brianakeafer@gmail.com or will.morrison1@outlook.com) —Update: It’s up again, but still free to send us emails! Here are some ways you can pray.